Love them or loath them, the 1980’s were a decade that saw the world change. With bold fashions, music that’s still popular, mobile phones the size of bricks and ghetto blasters the size of cars, the ‘80’s defined a generation. Now Microgaming have released a pokie themed around the decade that taste forgot, and decked it out in the bright colours that typified the era. Unfortunately, they have also made it play like something from a bygone age and seem to have forgotten to add any extra features other than wilds and scatters. On the plus side (maybe – depends on your point of view), there’s some very 1980’s sounding music that plays in the background, but if your taste doesn’t extend to synthesisers and electronic drums, then you will probably enjoy the game more by muting it. Is It A Thriller That Will Let You Relax? 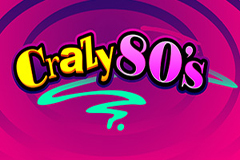 Crazy ‘80’s is a 5-reel game that features 9 paylines, with players able to wager from 0.25 up to 5.00 per line, which is definitely not 1980’s money. It’s a shame Microgaming haven’t given players the option to try out the game from just 0.01 per line, so placing a stake on all lines, which is always recommended, is going to cost a pretty steep 2.25 a go as a minimum, while those with Gordon Gekko-sized bankrolls will be pleased to see a maximum bet size of 45.00. A look at the paytable will reveal how much will be won each time symbols line up in the right places. To win a prize, players will need to get several identical ones coming to rest across an active line, with the row starting from the reel on the left side. The low-value symbols are made up of the 10, J, K, Q and A that so many games feature, all presented in suitably bright and bold colours. Picture symbols include an equally bright make-up collection, some Top Gun style Ray-Bans, along with a Rubik’s’ Cube and cassette tape (remember them! ), some magazines, a girl dressed in typical 1980’s style fashions and another one who, looks suspiciously like Madonna, who is the highest-paying regular symbol. She will treat players to 20x the line bet when landing across 2 reels on an active line, or up to 5000x if she graces all 5 reels on a line at once. There are of course a couple of extra symbols, but don’t expect them to do anything out of the ordinary, as this pokie has the grand total of zero bonus rounds. First up is the ghetto blaster which is a wild, and will act as any other symbol with the exception of the scatter, helping to make up more winning combinations. It’s got no other function however, so there’s no multiplier or jackpot payouts for a full line of wilds. The Flashdance-inspired scatter is a little more interesting however, as it doesn’t need to land in any particular spot to pay out a prize, and 3, 4, or 5 of them on the reels will equal wins of 2x, 10x or 50x the total stake per spin. However, in many other games the scatter symbols will often be the trigger for a bonus round, but not here, as that’s all it does. Once the bet is selected and the paytable checked out, it’s time to spin the reels, and with so many brightly-coloured symbols flashing past, it’s quite a sight. Borderline Great, Or Will it Make Players’ True Blue? Crazy ‘80’s takes you back in time faster than a DeLorean doing 88 mph. The whole look of the game shouts ‘1980’s’ at you, which is the entire point, but the lack of bonus features will take your breath away quicker than an F-15 can get to the danger zone. If you don’t get the ‘80’s references there, then Crazy ‘80’s is definitely not for you, and even if you do, it’s not the most exciting game. At least it all looks good, and being a Microgaming pokie, players will be guaranteed fair payouts, with results decided by a Random Number Generator with more computing power than Johnny 5 and a Terminator combined.